My wife is a big fan of “Gilmore Girls,” and when the show was on the air during its original run, it rivaled “The West Wing” for the fastest dialogue on television. 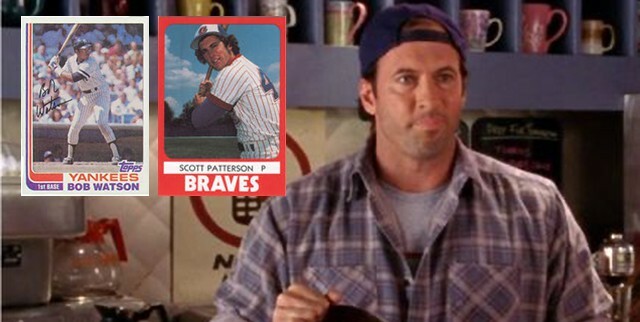 It also featured actor Scott Patterson, a former pitcher in the Braves and Yankees systems (plus a spring training with the Rangers and another with the Dodgers before his career ended). His baseball past is pretty well known (why else would his baseball cards be selling for so much?) but what I hadn’t realized is that he was actually a pretty decent prospect, rather than just someone with amateur talent who kicked around the minors for a few years before giving up his Major League dreams. After graduating from New Jersey’s Haddonfield Memorial High School, Patterson played at Rutgers and a couple of community colleges before the Braves drafted him in 1980. Following a rough first season in ’80 (7-10, 4.47 ERA), Patterson opened 1981 with 13 straight victories. He went 9-0 for Class A Durham, then won his first four decisions for Double-A Savannah … before finishing the season on a 1-8 slide. On April 23, 1982, the Braves traded Patterson to the Yankees for two-time All-Star Bob Watson — straight up. At that time in his career, Patterson was 35-26 with a 3.61 ERA and 1.9 strikeouts for every walk. 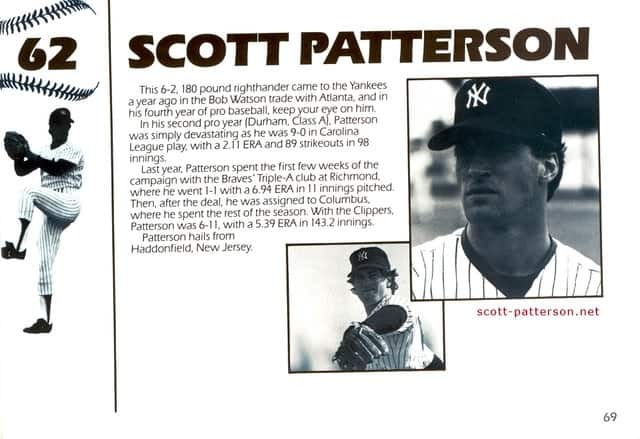 After the trade, Patterson spent the ’82 season with the Yankees’ Triple-A affiliate in Columbus, Ohio, but then split each of the next four seasons with Double- and Triple-A. His results varied and his ERA climbed, leading to the Rangers’ selecting him in the Rule 5 draft in December 1985 but selling him back to the Yankees before the season began. His final spring in baseball was with the Dodgers in 1987. He was 28, and when he didn’t make the team, he had a heart-to-heart with Hall of Famer Sandy Koufax. He had a pretty good swing for a pitcher, too.